I'm not really much of a football fan. Once in awhile there is an exciting game that a family member is emotionally invested in in some way. I've gone to a couple of Rose Bowl games and my favorite part was before the game started, when everyone stood up (some of us with hands over our hearts) and sang the National anthem. It's a "lump in your throat" experience to be singing The Star Spangled Banner with 100,000 other people on a glorious California afternoon, the first day of a new year. 1. Roll out dough about 3/8-inch hick and use small cutter (mine is a about 1.5 inches) to cut out mini footballs and place on baking sheet. 2. Bake according to recipe. Let cookies cool completely on cooling rack. 3. Tint some of the royal icing brown, until you have the shade you'd like. 4. Use a decorating bag with a #2 tip, and with the brown royal icing, outline and fill the footballs. 5. Let cookies dry completely or overnight. 6. Fill a decorating bag (#2 tip) with the untinted royal icing and add the white details to the cookie, including the eyes. 7. Immediately follow with the black royal icing for the eyes. 8. Using the food marker, add mouths and eyebrows. 9. Let cookies dry completely. Gosh...these cookies are too dang cute! I appreciate your comment, Lisa! Those are my kind of footballs! So cute. My husband would really get a KICK out of these - super cute! Oh Sue! These are so cute! I love the eyes and when you add them to a jar it is instant FUN!! Thanks, Lisa! Yep, jars are the best! 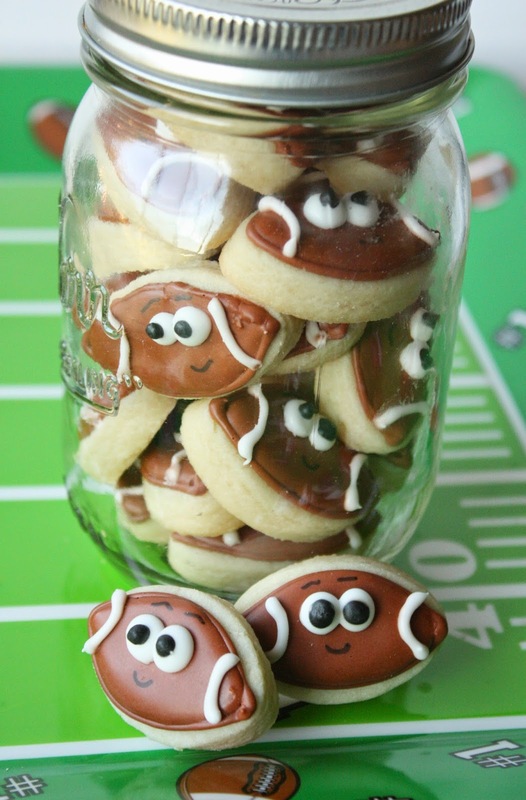 I'm not a big football fan either but I'm a big fan of your adorable football cookies! Oh my! These are seriously adorable!!!! Such cuteness Sue! I added some of these mini footballs to a sports cookie collection. They added such personality to the plate! Thank you.